In a mixing bowl, add 2nd or 3rd day idli batter, oat flour, rice flour, semolina and salt mix well. To this mixture, add 1/4 - 1/2 cup of water and stir well and make it to dosa batter consistency and keep aside. Then heat 2 tsp oil in a pan, when it is hot add mustard seeds and allow to splutter, and add chana dal, urad dal, hing and fry till dal turns golden brown. And to it add finely chopped onions, curry leaves and stir fry one for a minute. Then add this tempering to the prepared batter and mix well. And to the batter, add finely chopped cilantro and grated carrot and mix well. Now the batter is ready to make Oats Paniyaram. 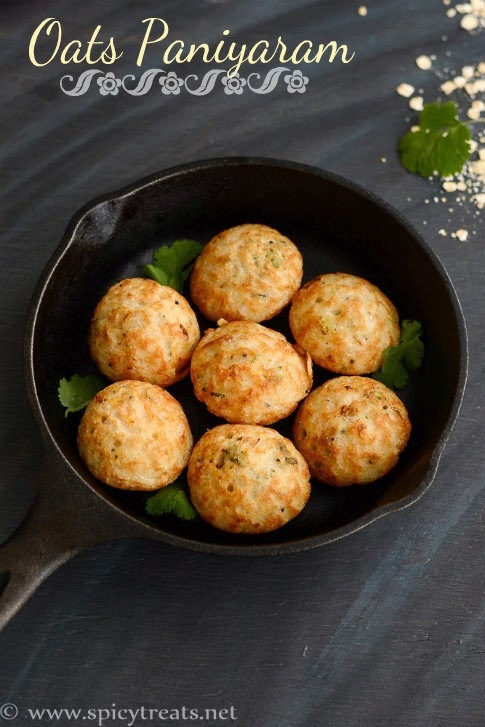 Heat paniyaram pan, add few drops of oil in each hole and then pour batter to each hole and cook in medium heat for 3-4 minutes. After that using skewer or spoon turn other side and cook for another 2-3 minutes or until it turns crisp and golden brown. Repeat the same procedure for remaining oats paniyaram batter. 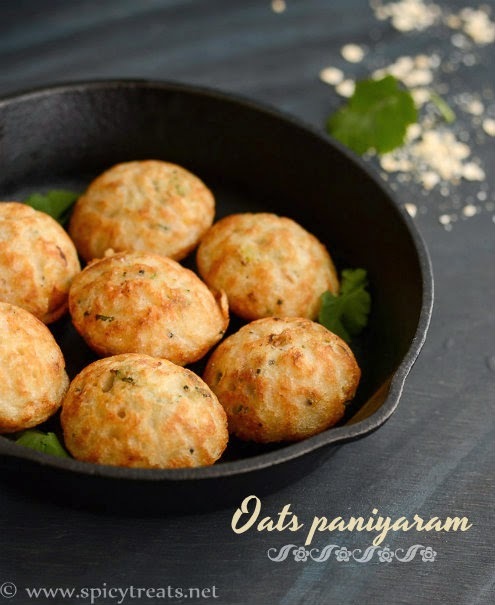 Then transfer the cooked oats paniyaram to serving plate and serve hot with desired chutney. 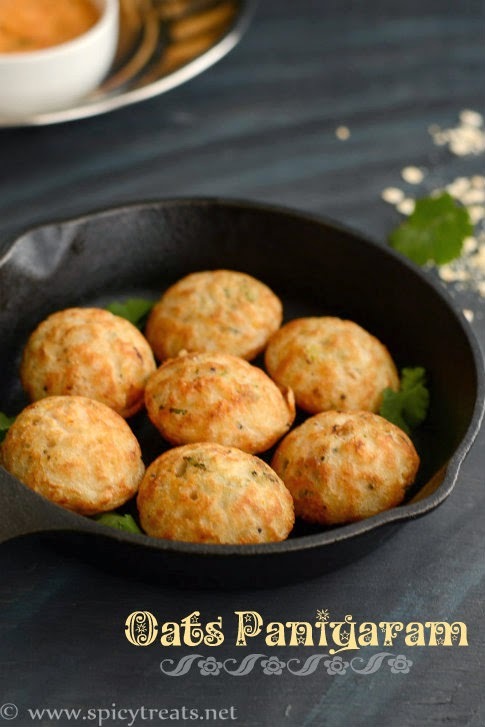 *You can use any idli batter - Idli Batter prepared using rice flour & Urad flour or Barely Idli Batter, Thinai Idli Batter, Brown Rice Idli Batter. I recommend 2nd or 3rd day batter, or if you use fresh idli batter add 2-3 tbsp of yogurt to the above recipe and follow the procedure. You can also add any desired finely chopped vegetable or spinach or any greens. 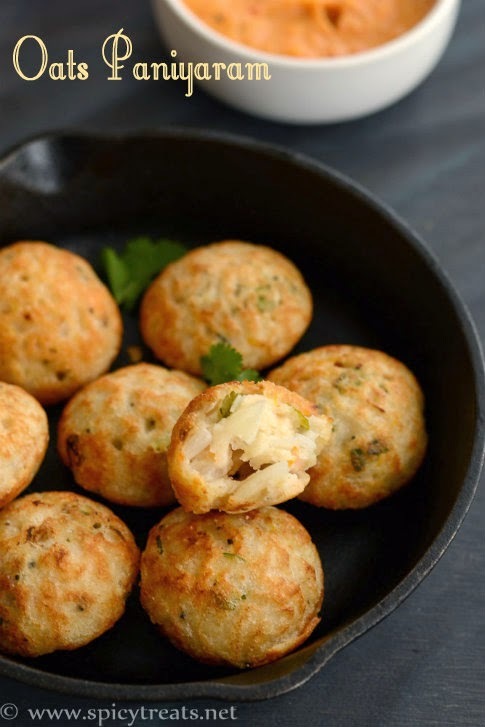 I am trying out a lot of healthier recipes and paniyaram is on the top of my list. 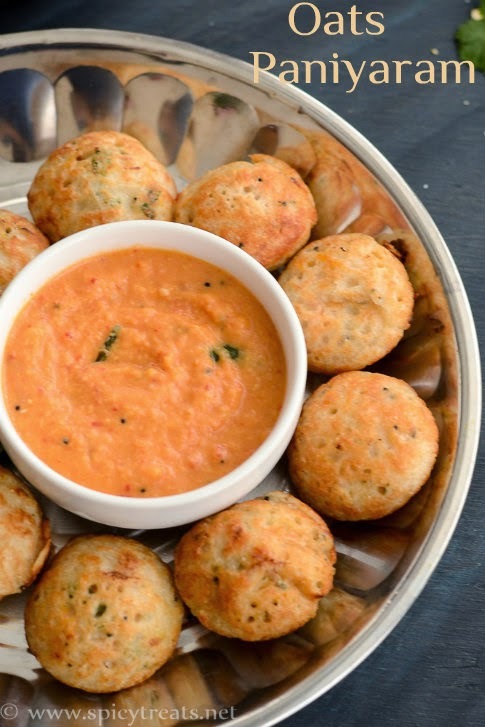 Love the idea of adding oats to the idli batter. Going to try this recipe soon.